I found a great example of oleander caterpillar infestation at a home service call in Naples yesterday. 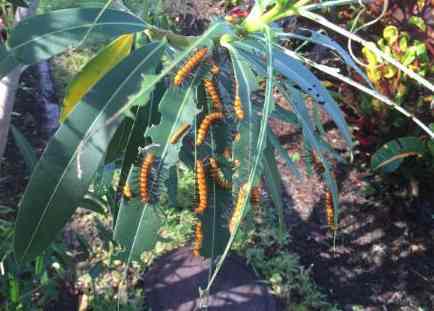 This is a mass of oleander caterpillars chowing down on a tasty oleander bush. You’ll notice these are notably different in color than the example on our caterpillar pest ID page and I’ll be adding this to the examples there shortly. If you see this type of infestation on your oleander bushes call me, John, for a prompt and free landscape pest control service estimate. Our pest control service area extends from Marco to Estero.